Hello, do you have any places on your trips for the eclipse. I am an experienced eclipse chaser and can help people with their observations and photography. Thank you for your enquiry about our 20 Day Northern Night Eclipse Tour. We unfortunately do not have any availability on this tour, however we do still have space on our 20 Day Southern Night Eclipse Tour departing from Victoria Falls, Livingstone Zambia on the 3rd of December. It's the Northern Night Eclipse Tour in the reverse. The Southern Experience tour is our most popular camping safari. It's a participation camping trip meaning you'll have to put up your own tent and a few other things but in terms of cooking, cleaning etc the guide does most of it. All meals are provided. It is a 20-day spectacular including the Okavango Delta and since it includes the eclipse, you get a bonus ! I can highly recommend this trip. It's a life altering experience. The rate is U$1200 per person and this is inclusive of a driver/guide, accommodation, food, park entry fees as well as all activities stated in the itinerary. We can also help out with any airport pick ups, drop offs or hotel accommodation before and after the safari. Just let me know what standard of accommodation you will be looking for. Thank you for your reply. I like your itinerary very much. Do you arrange flights as well (from London)? From where in Livingstone do you depart from? How close to the centre line will the eclipse be observed from? Can you hold a place for me until Friday when I make my decision depending on flight availability? Is payment on the internet or can I telephone you and pay by card that way (preferable). We unfortunately cannot assist with flights, you would have to contact your local travel agent. I will hold two places for you on the tour (it is for 2 people isn't it ? ), until Friday the 12th of October. We depart from the waterfront in Livingstone and the eclipse will be viewed in 100% totality at Kasane (70km's from Victoria Falls). With regards to payment, we require a 30% deposit to secure your place and final payment a month (3rd of November), prior to departure of the tour. We have a credit card charge form (attached) and I've included the "booking form" for you to complete. You can of course pay by bank transfer too if you wish. Thank you for your provisional booking I look forward to hearing from you. I've checked with an agency here for the flights and it can be done. I'll confirm with them and be back. Check my eclipses web page. If all goes well your company will get a mention on the Eclipse 2002 page that will be born of this trip. Wow - I've just briefly read through some of your past eclipse articles - brilliant ! So, you've been to South Africa before... and seen the Cape Town sights and surrounds. The Garden Route truly is awesome. If you have any extra time in the Cape at the end of your trip, I would highly recommend a drive over the Swartberg Mountain pass (from Oudtshoorn to Prince Albert) - it's one of the most spectacular mountain passes I have ever been on, truly breathtaking. (No eclipses though, only natural fauna and flora beauty). Just off of the Swartberg mountain pass is a turning into the "Gamkaskloof " nature reserve, to a place called "Die Hel" - a valley where once upon a time a community lived in isolation for over a 100 years. Herewith a website address for you to have a look at for further info. An experience I will never forget! Thanks and I await your reply on how the flight bookings went. "We depart from the waterfront in Livingstone and the eclipse will be viewed in 100% totality at Kasane (70km's from Victoria Falls)." I've checked my maps and figures and Kasane is NOT within the path of totality. Kavimba is at the northern limit of the path of totality. The center of the path is roughly where Savuti Marsh is. Outside the path of totality, only a partial eclipse is visible. Even a 99% eclipse will NOT produce the spectacular effects seen in my photos and it will not go dark. Here's the best image of the eclipse path I could find. 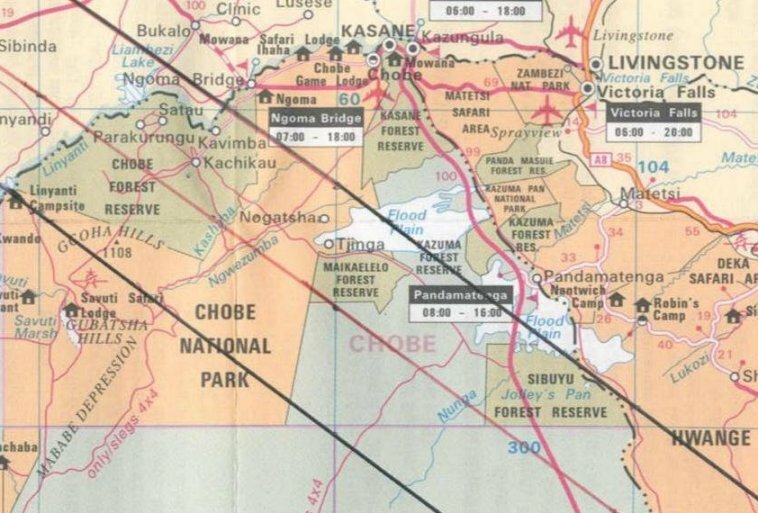 I note that we'll be going through Nata after the eclipse so perhaps we will be viewing totality from the Kasane - Nata road just south of Sibuyu. The path is represented by the two black lines. Only within that band will a total eclipse be visible. As you can see, Kasane is outside that band. The closer to the centre of the path (the red line), the longer and darker the eclipse. The duration of totality is over a minute but it should still be spectacular. Outside of the band there's no darkness, no corona, no pink flames dancing next to the sun, no stars. Can you check this for me as it is important. My sincere apologies for that - my boss has just confirmed to me that it will be viewed at a camp called "Out of Africa", 150 km's South of Kasane - he said it will be viewed in 100 % totality. Watching the eclipse from Kasane would be like going to Milan to see Pavaroti and listening to him from outside the Opera House. OK Kim, I can confirm my coming but it'll be just ONE place. My wife has decided to sit this one out. She's had a knee problem all year. I am enclosing the booking form and will ring you later to give you my credit card details. I would like to hire a sleeping bag as well. I will be arriving at Vic Falls at 12:55 on 01/12/2002; presumambly I can catch a couple of cabs to Livinstone. Can you arrange accommodation for me for 01/12 and 02/12 in Livingstone? Something near where we depart from; single room (onsuite if possible). I'd also like something for 22/12/2002 in one of the nice hotels at the Waterfront in Cape Town - it's nice there; lots of food places. Ha ha ha about the Pavarotti thing - but yes I know what you mean ! Thank you for confirming your booking. It's a pity your wife will not be travelling with you. I will send you the confirmation once we have received your credit card details. Please could you complete the attached credit card charge form and fax it back to us. We cannot accept credit card information over the phone - we have to have a faxed copy, including the signature. The best time to fax us is after 5pm our time - your time 4pm or 3pm if you've now changed over to winter time....this is because our internet line and fax line are the same, and we are on the internet most of the day - you may experience some frustration getting through. We can definitely assist with accommodation in Livingstone and Cape Town. As we leave from the waterfront area in Livingstone, there is a hotel called the "Zambezi Waterfront" - it's a 3 star hotel and costs US$ 53.00 per person per night in a single, including breakfast in a standard room. A riverside room is US$ 68.00 per person per night in a single, breakfast included. This is of course all subject to availability. With regards to Cape Town - where have you stayed before ? What is your budget per night (bearing in mind the prices for that time of the year will be high season). At 03:20 GMT, I faxed the credit card form signed and numbered to fax number 0027 21 6837826. It responded with an OK. I will aslo post it just to make sure. Please confirm receipt. I have booked my flights and will be arriving on 01/12/2002 and returning home on 23/12/2002. So, as the Americans would say, "we have a GO situation". Are you eclipsing? It's also total at Kruger. Kim, I've sorted my hotel in Cape Town. I've gone for Greenmarket Square. Nice and central, eh? I was looking at your Zambesi Riverside Hotel on the web over the weekend. It looks nice. Is it the one close to an island on the river, just outside Livingstone? I would definately like to stay there if it is. I arrive at 12:55 on 01/12/2002 at Victoria Falls on British Airways and they do a transfer from the airport to the hotel which would be useful. Can you book that too? I would then have one and a half days there. I'd go for a game drive and visit the Chief Makuni village nearby. Such fun. The more I read about Botswana and Namibia, the more I look forward to what looks to be a great trip. I await your confirmation for my Livingstone accommodation (for 01/12/2002 and 02/12/2002) and my transfer from the airport. Again, thank you for your kind attention and help. Hi Kryss, Thank you for your fax payment for the above tour. I will advise you once it has gone through and all in order. Attached, please find your booking confirmation. Consider the transfer booked. Would you like us to pre-book any tours ? Your accommodation at the Zambezi Waterfront is confirmed in a standard river facing chalet, for 2 nights, 1-3 December. I've confirmed an arrival transfer for you too. All I'm now waiting for is the price confirmation in writing, and will forward that to you as soon as I receive it. A visa for Zambia is required, however if you fill in the blank spaces on the attached passport details form, you will fall under the "visa waiver" programme. This is arranged by the hotel you are staying at, and I will forward it on to them. Don't forget to bring some mosquito repellent for during the day and evenings when you're not in your tent. (The tents are dome shaped with built in mosquito nets.) Please check with your pharmacist or doctor as to the health precautions you need to take. Most people travelling on our tours only take precautions against malaria, however please check with a professional in this field. Yes, Greenmarket Square Holiday Inn is central - will you have a car ? It will be more accessible to the beaches and waterfront if you do. I'm very pleased to be staying at the departure point and to have a transfer from the airport. Will there be a meeting before departure? I will get my malaria tablets. My injections should be up to date: my medical card has got more stamps than most passports! There are two tours I would like to do from Livingstone but I don't know if I can fit them both in. I want to visit the Chief Makuni Village AND I want to do a game drive in the nearby park as it has White Rhinos. Do you know how long the village tour is and when it departs? Otherwise I'll book the drive and get a cab to village. Of course, a lot depends on WHEN I arrive because I could do the drive on the afternoon I get there. I may have to book those as I get there. I've already been to the Falls (both sides). I enclose the passport details for the Zambia visa waiver. I will NOT require a car in Cape Town, I've already explored the Cape region and the Waterfront: I want to walk around the city centre. The Chief Makuni Village Tour is about 2 - 2 and a half hours long. The best time to go is apparently earlier in the day or in the late afternoon, because it gets so hot. There is no set departure time, we advise the operator there of the time you would like to go and a guide will meet you at the village and take you on the tour. You might be with other people, you might not, just depending if they've had other requests. A game drive to see the White Rhinos depart in the early morning and late afternoon. It is about 3 hours long, and costs US$ 27.50 per person (checking to see if this includes the park fees). You won't really see any other game besides the White rhinos. I got the invoice and I'll fax the credit card authorisation later in the day. I would like TWO tours booked for me for the same day: 2 December 2002. My arrival flight at Victoria Falls is BA6285 arriving on 1 December at 12:55. Almost done: Can you ask your boss to confirm the location of the Out of Africa camp where we will see the eclipse. I am assuming it is on the Kasane - Nata road south of Sibuyu Forest reserve and I have purchased an enormous map of the area. I have just returned from the three weeks "camping safari" with Camp Wild. I have to say a big thank you, firstly to your good self, for organising such an excellent itinerary for me and patiently responding to all my questions and concerns. It all fitted into place from the moment I stepped off the plane at Vic Falls and was greeted by a placard with my name on. It continued with an efficient transfer to a very nice hotel, followed by two superb tours and a meeting with that strange bloke called Garth (only kidding, mate). Next a big thank you to Garth (the man himself) who trusted me, a rather eccentric character from half way around the world, to navigate two Camp Wild tours to what I alleged was the centre line of a total eclipse. According to one of our group who was monitoring these things, the start and end times I estimated for totality were correct to within a second. According to a German with a telescope, already at the site we selected, we were, indeed, within a kilometre of the centre line. Finally, a very big thank you to Elton, our driver and guide for three weeks. He led with calmness, knowledge and wit. He was patient enough to answer my many questions about the wildlife, culture and geography. He put up with my complete lack of outdoor expertise (and my snoring). He put up with me getting up at odd hours and noisily enthusing about the clear southern sky. He put up with my frequent wimpish requests for upgrading to chalets. He even put up with my odd tastes in music. Hope he enjoys the cassette I left with him. The next Total Eclipse of the Sun is in Antarctica (23 November 2003) but I don't think I'll be doing that one in a tent! Greetings from the Northern Hemisphere. Thank you for your wonderful email, I'm glad you had a great time. Apologies for not replying sooner, but I have been on leave, celebrating the festive season with my mom in Richards Bay, Natal. I will extend all your thanks on to Elton as soon as I see him, as well as your comments. Garth is actually speaking to someone about sending clients to the Antarctica eclipse - should we be participating in this particular eclipse, I will definitely send you the information. No, I don't think a tent would be suitable ! I've just tried to go onto your website to check out the pics...very exciting, I can't wait to see them. Take care and all the best for 2003.